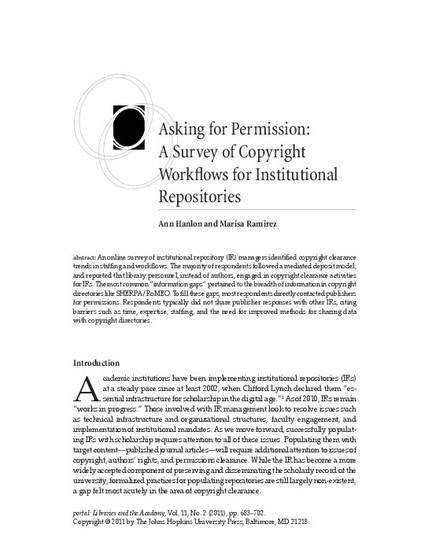 An online survey of institutional repository (IR) managers identified copyright clearance trends in staffing and workflows. The majority of respondents followed a mediated deposit model, and reported that library personnel, instead of authors, engaged in copyright clearance activities for IRs. The most common “information gaps” pertained to the breadth of information in copyright directories like SHERPA/RoMEO. To fill these gaps, most respondents directly contacted publishers for permissions. Respondents typically did not share publisher responses with other IRs citing barriers such as time, expertise, staffing and the need for improved methods for sharing data with copyright directories. Published version. portal: Libraries and the Academy, Vol. 11, No. 2 (April 2011): 683-702. DOI. © 2011 The Johns Hopkins University Press. Reprinted with permission by The Johns Hopkins University Press.